It’s the final game of the season at UB Stadium, which means it’s Senior Day. While it may not be their last game in Blue & White, it will be an emotional day for the Bulls 16 graduating players. It’s an interesting group, that has ties back to the 2013 Khalil Mack-Bo Oliver bowl team, underwent a coaching change, and has been part of an exciting present and bright future for the program. Seniors like captains Jarrett Franklin, Demone Harris and Jamarl Eiland have helped lead this team through the tragic death of teammate Solomon Jackson, and last year’s development season of just two wins. Players like Ryan Williamson, Tim Roberts, Kamathi Holsey, Brandon Manosalvas, Chris Ford, Jacob Martinez & Ishmael Hargrove have been major contributors throughout their career. If any group deserves to play another game, especially in a warm location, it’s these guys. Bull Session Trivia: Ohio quarterback Nathan Rourke is second in the country with 19 rushing touchdowns. The player who’s first has 24, and he’s also played against the Bulls. Can you name the nation’s leading scorer? The Bulls offense continues to climb up the rankings in the MAC, and the NCAA. The Bulls are #2 overall in the conference, and #1 in passing with an average of 290 yards per game. Nationally, the passing offense is #22 in the country…The offensive line also earns some high rankings. UB is 10th in the nation in fewest tackles for loss allowed, and #22 in fewest sacks…There’s a good chance the Bulls will set a school record Friday. With 130 yards, the offense will break the school record for passing yards, set in the 14 game season of 2008…With one touchdown, Anthony Johnson will tie Naaman Roosevelt’s school record for touchdown catches in a season. Johnson has 12. Roosevelt had 13 in 14 games during 2008…AJ is up to #3 in the country in receiving yards, and his 12 TD are tied for 3rd nationally…Johnson’s dominance has continued to open up chances for the Bulls other receivers. Against Ball State, Antonio Nunn had 57 and 45 yard catches for his first career 100-yard game…The passing offense also created room for the Bulls to run against the Cardinals. 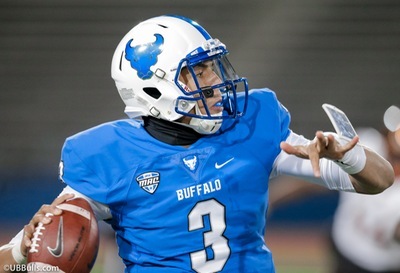 Emmanuel Reed’s 123 yards and Theo Anderson’s 91 yards almost created the first dual-100 yard games since 2014…Tyree Jackson became the first UB quarterback to top 300 yards passing in three straight games. T3 has collected 1069 yards passing since returning. More importantly, he’s completing 64% of his passes during that stretch…Don’t bother to look up the MAC stats to see where Jackson ranks. Because they use a system based on games, and not passing attempts, Tyree is not among the top ten despite a per-game average of 257 yards. That would rank 2nd among league QB’s. Two players who average less than 100 yards passing a game are in the rankings. The NCAA stats list Tyree as 69th in the nation in passing yards, with 1802 in seven games…Running the ball against the Bobcats will challenge the Bulls offensive line. Ohio is second in the MAC in stopping the run, just behind Northern Illinois. OU has held teams to less than 70 yards rushing four times…Big DT Cleon Aloese and outstanding middle linebacker Quentin Poling are a big reason why. Both are among the best at their positions in the conference…Poling is the MAC’s #3 tackler, but that’s still 42 behind leader Khalil Hodge…Linebacker Chad Moore & safety Javon Hagan are also heavily involved in stopping the run…But the Bobcats are last in the MAC in stopping the pass, allowing 258 yards per game. This despite a veteran secondary that has started every game this season. Corner Bradd Ellis is 2nd in the NCAA with 20 passes defended (2 interceptions, 18 pass breakups). What a two week stretch for UB defensive end Chuck Harris. He’s had 18 tackles, 2 sacks, 4 tackles for loss and 2 forced fumbles in the last two games. Against Ball State, Harris recorded a career-high 13 tackles…Combined, defensive ends Harris & Harris (Demone) have been laying down the law with eight combined sacks and 15.5 tackles for loss…With 12 tackles against Ball State, Hodge has had double-digit tackles in nine of his eleven games. He continues to lead the MAC, and rank 2nd in the NCAA. With five stops, Hodge will move up to 2nd in UB history in season tackles. He is 20 away from Craig Guest’s all-time record of 161 set in 1995…Ryan Williamson had his 6th career interception against Ball State. As his career closes out, the safety from Cincinnati has played in 44 games, started 35 and totaled 232 tackles…Linebacker Jordan Collier has elevated his game, with 33 tackles in the last five games. He’s now the team’s 4th leading tackler behind Hodge, Williamson and Chuck Harris…The entire UB defense will face one of its biggest tests against an Ohio offense that leads the MAC in rushing. The Bobcats total over 250 yards per game on the ground, and lead the conference with 40 points per game…QB Nathan Rourke has burst onto the scene this season. The sophomore from Oakville, Ontario has started the last nine games, and he’s run for 833 yards while throwing 14 touchdown passes. Rourke is 5th in the MAC in rushing, 6th in passing and 5th in total offense. He is the key to the Bobcats option offense, along with running backs A.J. Ouellette and Dorian Brown. Ouellette is the MAC’s #3 rusher with 971 yards. Brown has 605 yards, an averages 6.1 yards per carry. Brown did appear to get hurt in OU’s last game against Akron…The Bobcats leading receiver, Brendan Cope, also was hurt against the Zips and has been ruled out of Friday’s game…Whether catching or running, wideout Papi White is dangerous. He averages 17 yards per catch, and started last year’s UB-Ohio game with a first play, 73-yard score…Ohio’s red zone numbers are amazing. On 56 trips inside the 20, they have scored 45 touchdowns and 7 field goals. Those numbers are among the best in the country. As pointed out above, the Bulls offense has been amazing this season. But a deeper dive into the offense’s success reveals some incredible achievements and accomplishments. The Bulls have produced 19 plays of 45 yards or more. Last year, they had just five. Those 19 plays have come from 10 different players, showing the depth of the team’s playmakers. Jackson has been a part of plays this season that have covered the following yardage: 75, 69, 58, 56, 52, 51, 51, 50, 48, 46. The best news? Of the 10 players who have had a 45-yard play, 8 will return next season. Bull Session Trivia Answer: Florida Atlantic running back Devin Singletary leads the NCAA with 24 rushing touchdowns, and 12.6 points per game. In September, in UB’s win, Singletary scored three rushing touchdowns at UB Stadium. FAU has not lost since that game, winning eight in a row. Please join me, color analyst Scott Wilson, game host Brad Riter and postgame host Bob Gaughan for the broadcast on the Bulls Football Network. Our pregame show starts at 12:00pm. You can hear it in Buffalo on ESPN 1520 and in Rochester on Fox Sports 1280. A link to the online broadcast is also available here and on the Tune In app.